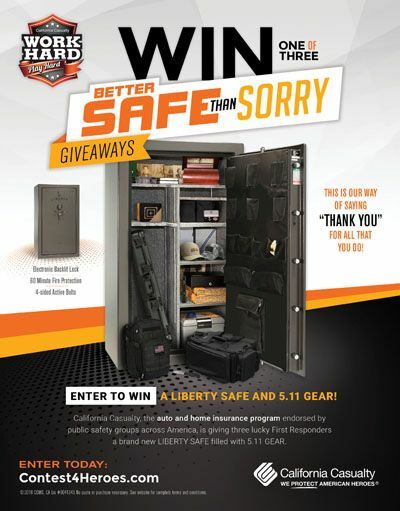 SAN MATEO, Calif. — California Casualty, provider of auto and home insurance for first responders across the country, is reminding law enforcement officers, firefighters and EMTs that they can win a Liberty Safe filled with 5.11 Tactical gear from the company’s Work Hard/Play Hard “Better Safe Than Sorry” Sweepstakes. Three lucky winners will each receive $2,250 to purchase the Liberty Colonial Safe of their choice. The 5.11 gear includes a carry bag, backpack, RAID Glasses, flashlight, hats and more. The entire package has a value of $2,950. Nearly 25,000 members of public safety groups have entered the “Better Safe Than Sorry” Sweepstakes since it kicked off in March. The deadline for entries is November 12, 2018, at www.contest4heroes.com, with winners announced in December. California Casualty protects American heroes with auto and home insurance tailored to their professional and personal needs. The “Better Safe Than Sorry” giveaway provides another layer of security for the important possessions and personal protection of law enforcement officers and firefighter/EMTs. The fire and water-resistant safes also safeguard important documents and home inventory lists. California Casualty’s auto and home insurance provides public safety employees and volunteers special benefits not available to the general public: the Fallen Hero Survivor Benefit, $500 coverage for personal belongings (including uniforms and turnout gear) taken from an insured vehicle and $5,000 coverage for firearms (with higher amounts available). Now, members of public safety organizations can get protection for hard to replace items by entering California Casualty’s “Better Safe Than Sorry” Work Hard/Play Hard Sweepstakes. The deadline is November 12, 2018 and details are at www.contest4heroes.com. Find out why California Casualty is a company that first responders can trust at https://mycalcas.com. *Liberty Safe and 5.11® are not participating partners in or sponsors of this contest.